Hinshaw, Delbert, lodger, age 25, born in North Carolina; completed 11th grade; on Apr 1 1935 was living in rural Alamance County, North Carolina; single; occupation: ice plant; worked 52 weeks in 1939; $500 wages in 1939. Delbert's obituary was published in "The High Point Enterprise" (High Point, North Carolina) on Friday, May 7, 19656 (see scan below). Obituary of Mary Lou (Hinshaw) Andrews. "High Point Enterprise", Aug 24 1969; http://www.ancestry.com. 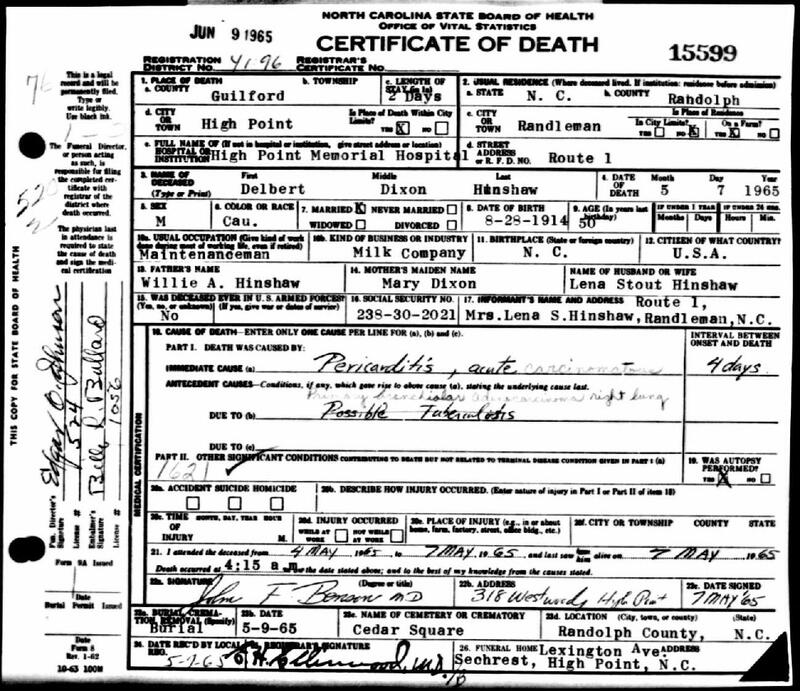 Delbert Dixon Hinshaw death certificate; North Carolina, Death Certificates, 1909-1975; http://www.ancestry.com. Obituary of Delbert Dixon Hinshaw; "The High Point Enterprise", May 7 1965; http://www.ancestry.com. 1920 census, Albright Township, Chatham County, North Carolina; roll T625-1289, ED 1, page 5A, line #10, dwelling #85, family #86. 1930 census, Albright Township, Chatham County, North Carolina; roll T626-1680, ED 1, page 5A, line #8, dwelling #88, family #88. 1940 census, New Market Township, Randolph County, North Carolina; roll T627-2962, ED 76-24, page 3B, line #41, household #47. 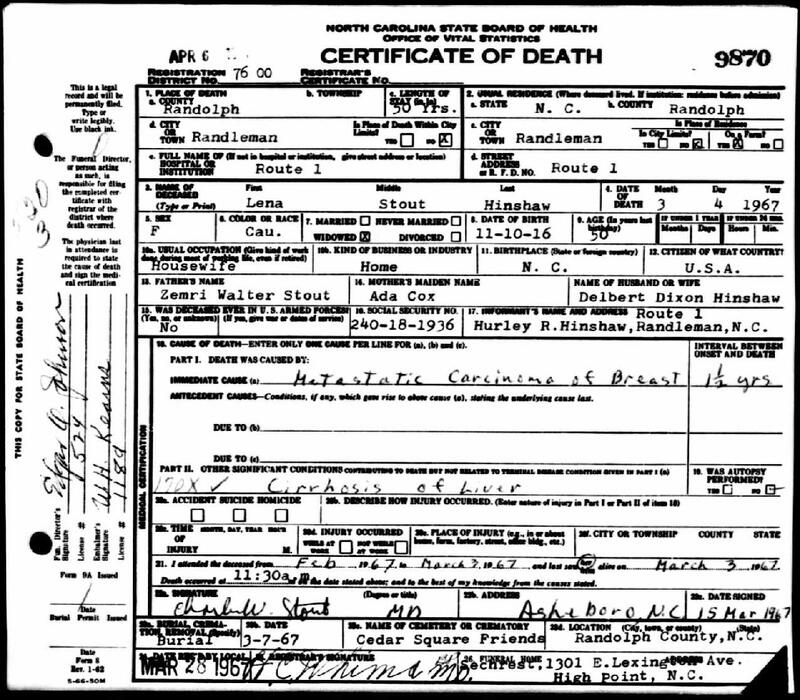 Lena Emma Stout death certificate; North Carolina, Death Certificates, 1909-1975; http://www.ancestry.com.